Where Smart and Healthy Work Together. The use of Cost Effectiveness analysis, a branch of decision analysis, can be used to produce more useful and actionable data and information. In this analysis, one sets up a decision tree model to determine a treatment choice, or in this case a wellness program choice, and directly charts how its costs and benefits affect the decision. Health and Wellness programs that appeared in the corporate world two to three decades ago were considered more an employee perk than a focused effort to change behaviors and influence organizational health, staff performance, and healthcare cost factors. However, various emerging trends and solid research data have led corporations over the last several years to look at employee health and wellness as an investment in worker productivity, staff retention and an opportunity to directly impact utilization and cost of a growing healthcare cost liability. It seems intuitive that a workforce which does not smoke, is not overweight, participates in exercise programs, and eats healthy will perform more efficiently and cost the corporation less in terms of fewer sick days and lower healthcare costs . But how does a corporation go from a generally good idea to implementing a program which has significant costs, but conversely has the potential to foster even more significantly real cost benefits. Measuring real cost and value have presented considerable challenges to health and wellness professionals and consultants in the industry. Some programs have attempted to use Return on Investment calculations (ROI) to help in decision making. ROI by definition is Net Profit/Investment (gain from investment-cost of investment)/cost of investment. While at first this calculation seems simple and straight-forward, there are many pitfalls in using this calculation Principally, in that ROI was really designed for investment in property, manufacturing equipment, and other capital acquisitions or expenditures. ROI cannot effectively measure returns on anticipated outcomes and the costs of achieving them. Nor can it measure opportunity costs. And, these are the critical measures and questions of health and wellness programs. The use of Cost Effectiveness analysis, a branch of decision analysis, can be used to produce more useful and actionable data and information. In this analysis, one sets up a decision tree model to determine a treatment choice, or in this case a wellness program choice, and directly charts how its costs and benefits affect the decision. In this technique, we investigate and quantify the costs of certain interventions and their outcomes. One can also include opportunity costs (the cost of not doing something) in the model. The benefit is typically measured in terms of Quality Adjusted Life Years which is not only the benefit of living one year longer, but living it in a quality and enjoyable manner. Techniques have been developed to quantify this, and from a corporate perspective, it may be correlated directly to costs associated with various employee outcomes or actions, such as productivity, absenteeism, turnover, or other such factors as the organization may measure or choose to measure in the future. These, in turn, may be linked to the direct costs of corporate-funded healthcare. 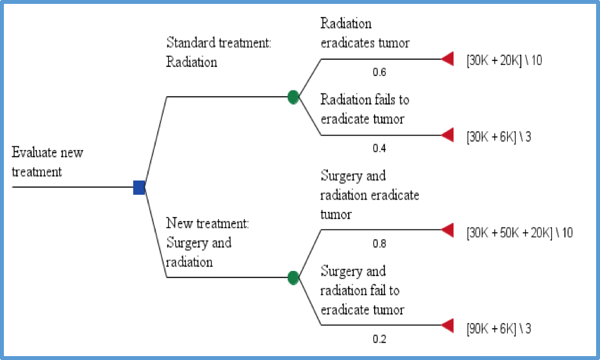 In this example, one can evaluate the effectiveness of a standard treatment for a tumor versus a new treatment. The costs are in the numerator (dollars), and the effectiveness in the denominator (usually representing quality adjusted life years). The best choice is the branch with the lowest ratio (cost/effectiveness)—here the Standard Treatment arm that Eradicates the Tumor. Likewise, we could use the cost of a particular Health and Wellness Program, and model how changes in health status will affect the costs and benefits to the workforce at the organization. The model can be as simple or as complex as one wishes to model it. It can directly visualize how much an organization may wish to invest in a wellness program in order to get desired benefits. Although my example is a model of different treatments for diseases, the analogy is that a particular intervention in a corporate health and wellness program is a type of treatment that can actually impact health for the employees and healthcare costs for the employer. The benefit of this type of analysis lies in its flexibility. Although general programs for corporate health and wellness exist in many organizations, the specific programs are dictated by a combination of the desire of the employee population and the desires and needs of the corporation. Benefits can include healthier employees who can work more efficiently and effectively while at work, and have less time off for illness. It can also give the employee a sense of belonging to the organization, which can have secondary beneficial effects for the organization. Such benefits can be incorporated into the model in the denominator as a form of quality in the Quality Adjusted Life Year (QALY) measurement. A survey could be conducted of the employees in a specific organization to determine what is most important to them and even quantify just how important each benefit could be. From the perspective of the organization itself, there are numerous potential benefits to the corporation. Healthier employee populations can work for longer periods of time and more efficiently. Furthermore, they would have fewer sick days off which are in effect an opportunity cost (cost of not having someone at work). This can further correlate to lower health insurance premiums if statistically fewer employees are making claims. This is a definite direct cost savings for corporations participating in health and wellness programs. A model could be constructed to incorporate the premium costs to the organizations in two scenarios: one with a particular wellness program and one without. The difference in cost savings can guide the organization in how much they could spend on a program and still be ahead from a cost/benefit perspective. Another issue arises as to the time horizon for both investment and at what point the organization can see beneficial effects from its investment in a particular wellness program. One problem that employers have a difficult time visualizing when considering a wellness program is the length of time it will take to see a difference or a return on value. In general, most corporate wellness programs will say that it will take 2-3 years to see a difference. Using CE analysis, one can actually track the benefits over specific time periods. Furthermore, there are advanced modeling techniques that can simulate the course of chronic debilitating diseases over time. These models will incorporate the probability that something will happen as a percentage of certainty per year, and then it iterates the probability over X number of years to give one an accurate idea of the cumulative effect of a disease outcome over time. This capability is not at all possible using ROI or VOI calculations. Since many common health problems that can affect the corporation fall into this category (heart disease, lung disease such as COPD, smoking, obesity), cost effectiveness analysis is the only accurate way to model the outcome of such diseases and the benefits of intervening through corporate health and wellness programs. In assessing the costs and benefits of corporate health and wellness programming and strategies, an organization may begin with a record review of healthcare expenditures to gather a picture of current healthcare utilization and the determination of interventional points of opportunity. A second step would be to survey the work force based both on demographics and behaviors, as determined important by the corporate health and wellness director. This process will develop data points that may be used to then create the type of analysis presented here.